Let me introduce myself, I'm Kate Hoerauf. I am a self-taught artist, sewer and crafter. My style is very eclectic and the mediums I use range from glass to textiles with a dash of painting, just to name a few. More often than not I try to my own photographs to help inspire my projects, whether or not they are utilized in the project. 2012 Honorable Mention Winner in the Glass and Ceramics category of the Gifts of Art Exhibition at the University of Michigan Health System, for my fused glass panel "Spring Flowers". I exhibited in the 2013 show, my fused glass sculpture & panel "Ascending". 2008-2011 Art Quilt exhibitor in the Michigan Quilt Artists Invitational traveling art show that went all over the state of Michigan. Displaying in order, "History Eye Pi, Served Fibonacci Style", "The Forget Me Knot", "Into The Awe-Byss" and "The HeArt of the Kitschen". 2009 "I'm Just a Home Body" wa exhibited in the Breaking Traditions Art Quilt Exhibit titled "Home" seen at the American Sewing Expo in Novi Michigan and in sever venues throughout the state. 2013 Fused and slumped glass piece "Water Lilies" displayed in the Views and Visions Art Show & Sale at the Huron Valley Council for the Arts in Highland Michigan. 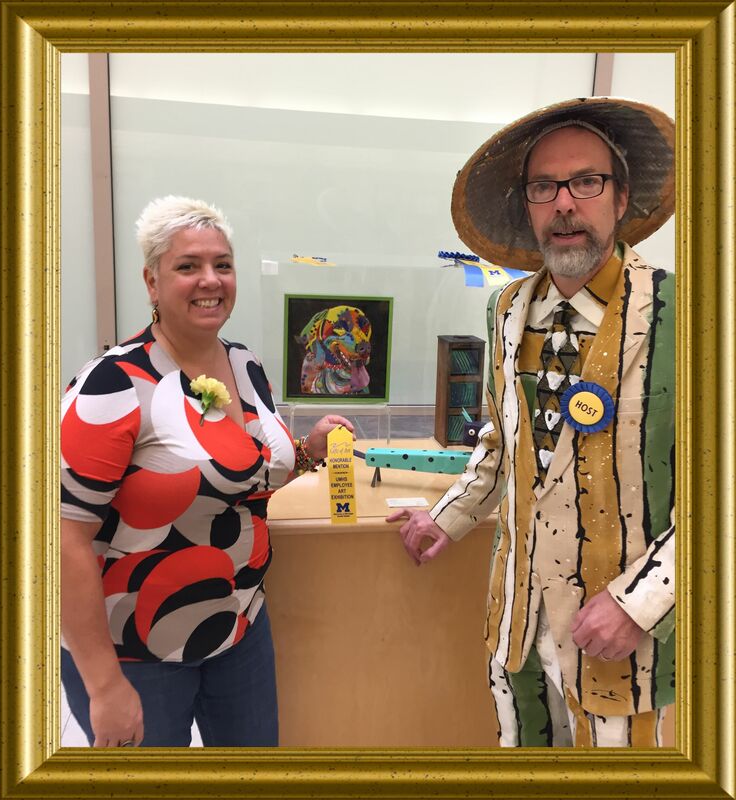 2016 Honorable mention winner in the Glass & Ceramics category of the Gifts of Art Exhibition at the University of Michigan Health System, for my framed fused glass panel "Pop goes Rhea". sewing of all kinds: quilts, home décor, clothing, costumes, repairs and tailoring. painting murals, ceramics, stenciling and faux painting.